Whether it is for a holiday or just for everyday decorating, using rope lights to liven up an area of your home is a fun way to decorate. With many tiny lights being surrounded by a plastic or rubber casing, you will have what is called rope lights, since they resemble a rope. They are seen in many holiday displays, such as lining store windows, wrapped around telephone poles or trees, or running along above the ground on stakes. In your home you can use them as accents to decorate a patio, line a wall for a soft glowing light in a bedroom or to provide light in a dark closet. Although you will see a lot of clear colored, rope lights come in a variety of colors, especially around holidays like Christmas where a large assortment is seen, or even Halloween when purple and orange are common. You can even find ones with clear opes and different colored bulbs inside. LED lights are many times used inside the ropes. When LEDs are used in rope lights, they have a much longer life, and this is a great feature since the bulbs in rope lights are not meant to be replaced. LEDs can also be colored with a computer chip and are easy to program if you want to create a blinking or chasing pattern, plus they are very durable. The lifespan on these lights is said to be 25,000. At four hours per day of usage, that is about seventeen years. They can also stand up to shocks and frequent on-off cycles. Another great feature of rope lights is that they can be used to decorate in a variety of ways, and they can be used indoors or outdoors since they can stand up to a lot of inclement weather. They are a favorite to use at Christmas, so being able to withstand severe weather conditions is a great plus! Incandescent Rope Lights are the first ones made, and are cheaper because of the incandescent bulbs used, but do not have the long life of the LED rope lights. LED Rope Lights are growing in popularity due to their long life and the fact that they use less energy but produce brighter light without generating more heat. Chasing Rope Lights turn individual lights on and off to create a chasing pattern, available in incandescent or LED. 12 Volt Rope Lights is a smaller option for accent lighting that uses a mini-string of 12 volt rope lights. Rope Lights – Are They Expensive? Depending on the type of rope lights you buy, you will find that some are more expensive. The standard and original incandescent rope lights are a lot cheaper, but again have less of a life. 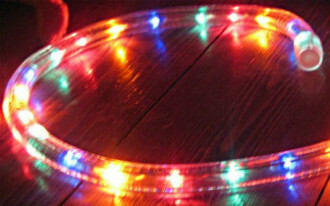 The LED rope lights are more expensive, and this is because of the process that is used to make them. It is a solid state light bulb that does not have a filament, so it is more expensive to make them than regular bulbs. Although people generally love rope lights and there are many advantages to them, if you are buying the LED rope lights, the cost can obviously become a factor since they do cost more than the traditional incandescent ones. Also, you may notice a different light output with the LED ones as well. It may not be as bright as you would notice with regular lighting, and the color might not be quite right either because of the fact that LED lights emit light in very narrow wavelengths. Another factor that can affect rope lights negatively is they are all wired on one circuit. If one bulb goes out, they all do. And, since these bulbs really arent replaceable because of the casing over them, you are looking at buying a whole new set of rope lights. Before shopping for your rope lights, keep in mind exactly what you are looking for. Dont be fooled by companies offering extra- long guarantees on the lights longevity. If you read their fine print you will find that their so-called guarantee covers nothing in the end. Some rope lights are also not made with the same quality as is necessary for a premium product, as they do not have the right additives to the PVC. If you decide to purchase your rope lights online, be aware of lower cost lights. Check to see how much the shipping is to make sure they are not making up for the low cost of the lights in their shipping prices. If you take the time to decide which rope lights you would like and learn about the differences of each, you will be sure to find the ones that will suit your decorating needs.